Ivan Gonchorov [ 1 ] invented Ilia Ilitch Oblomov, a rich landowner, who woke up every day realizing how urgent it was to work out how to rescue his failing estate. After half an hour of fret he would decide that he might as well have tea in bed while he worried. As the morning wore on he continued to avoid thinking about his problems or even getting up. After years of such days he died in poverty and loneliness. Oblomov is not an attractive character but we have a soft spot for him because we dread that even a slight increase in our own procrastination may tip us into his oblivion. Why do we procrastinate at all? Why do some of us procrastinate more than others and do we get worse as we grow old? I visited a library to find out. As always, I found that my colleagues have painstakingly answered questions that I would never have asked. 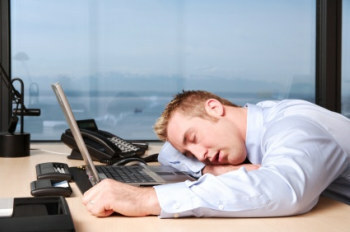 A poll of young and middle-aged adults found that 20% described themselves as chronic procrastinators  Self knowledge and observation of my learned colleagues makes me puzzled that those with longer educations claimed to procrastinate less, but I completely understand why those who have been married, but are now widowed or divorced, notice their procrastinations more often. Marriage shreds many cosy self-deceptions. Other studies were of university students who are always soft targets for prowling staff of psychology departments [e.g .3]. Most seem to have used the splendidly titled Procrastination Assessment Scale – Students (PASS) and all have found that undergraduates claim to procrastinate more than graduate students, and about different tasks. Undergraduates procrastinate about revising for examinations, graduate students about writing term papers. This seems unsurprising because to qualify to become a graduate student implies having learned at least a little study discipline, and assessment procedures change after graduation. This study also notes that students who felt that they had less control over their own destiny tended to procrastinate more. A “why bother?” model seems intuitively appealing. Another paper [ 4 ] reviews the literature on procrastination among university students, adding new data from a survey made in a Turkish university. The authors estimate that, on average, 70% of students procrastinate “at least occasionally” and 50% procrastinate “half the time or more”. Decades of listening to delightfully imaginative excuses in Cambridge, Oxford, Durham and Manchester make me suspect these may be underestimates but perhaps Young Turks do have a reputation to live up to. A different study of both Canadian and Dutch students  included personality rating questionnaires with procrastination questionnaires and decided, rather judgementally, that “trait” procrastination is associated with high scores for “lack of conscientiousness” and with descriptive adjectives such as “undisciplined”, “lazy“ and “disorderly” (It is not clear why “feckless,” “supine”,” idle” and “loutish” were omitted). Procrastination was also associated with low scores on measures of “the six facets of conscientiousness: Competence, Order, Dutifulness, Achievement-Striving, Self-Discipline, and Deliberation”. (Again it is unclear why “being an excruciating proctalgic pain” was left out of this grim list). It is unsurprising to learn from this and other studies that procrastination is associated with neuroticism, depression and anxiety but, oddly, the phrase “Pull Yourself Together” is not used. In short, this library search gave me little that I really need to know and nothing on whether procrastination gets better or worse as we grow old. My curiosity about possible age-changes in procrastination was triggered, 35 years ago, by conversations with Freda Newcombe, a distinguished British clinical psychologist who studied a large group of survivors of head injured veterans of WW11. All of these patients were appalled that they could no longer bring themselves to start to do even very simple things. Their injuries were so varied that Freda could not work out whether any particular brain system is essential to trigger initiatives to start doing anything at all. Listening to her talk about her patients I used to think that, because they were no longer young, their chronic oblomovitis might be due to global brain ageing rather than to their specific head injuries. I have searched for, but have not found neurological evidence that we need some specific local brain systems to get us started on anything that we have to do. 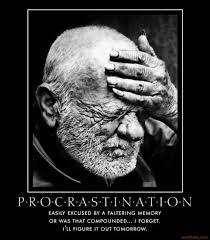 Nor have I found convincing behavioural comparisons of procrastination in old and young people. If I have missed relevant work I would be very grateful indeed for a guide to it. There is, of course, a large and useful literature on failures of “prospective memory” – making and remembering to carry out plans to do things. Prospective memory certainly declines in old age, and is associated with specific damage to the pre-frontal cortex of the brain. But prospective memory is very different from procrastination. As all Oblomovists know, the bitterest aspect of procrastination is the vivid and painful and persistent memory of just what it is that we must do and the precise details of how we must set about doing it. Faced with an apparent gap in the ageing literature I can only pick up ideas from a few studies that consider why young and middle-aged people procrastinate and check these against my intuitions as to what is happening to me in my old age. I was delighted, at last, to find a study that actually admitted that different people may procrastinate for different reasons  – in this case depending on whether their attitudes are “arousal or avoidant”, and how these attitudes are related to “past, present or future time conceptions”. After a bit of puzzling I worked out that this means that people may put off doing something because they find it really hard, or unpleasant to think about (“avoidance procrastination”) and so let things slide (“present fatalistic time orientation”) or because they are currently having a pretty good time (“present-hedonist procrastination”/ “arousal procrastination”) and prefer not to break off to do something else that is probably going to be mind-rottingly tedious (“negatively with future-time orientations”). It was also a pleasure to discover a paper by the great Stanley Milgram and associates  telling us that people procrastinate more often about difficult tasks, and about things that they are not sure that they can actually manage to do. The sage conclusions of these two papers [6,7] chime with my subjective experience. In old age I find that more things have become hard and the number of things that I am not sure that I can now manage is greater. So my tally of hard things postponed to a vague future steadily increases. On the other hand, as my age increases so do good reasons for postponements. For example every passing year increases the odds that I shall be safely dead before my tax return is due. Also, following the “present hedonistic” argument, present mirth hath present laughter and what’s to come is still unsure. Only a very sad old idiot would exchange current fun for boredom in hope of uncertain future gain. The psychological literature does not seem to have tackled the central paradox about procrastination: It is far harder to start doing things than to actually do them. This quandary leads me into bizarre situations such as reviewing other peoples’ journal submissions, which I detest, instead of getting on with writing my own, which is sometimes a bit more pleasant. I have even been known to sort and roll up socks to avoid analyzing data. Crazed choices of tedious diversions from more interesting tasks have plagued me all my life, but nowadays seem more frequent. This is partly because many things, such as data-analysis, actually have become more difficult and so more tempting to avoid. Fortunately, as throughout my life, most of my dragons turn out to be imaginary and the sensible thing, that I seldom manage, is to force myself to start a deferred task and so discover whether I can still surprise myself or whether it really is time to give up trying. Even incompetent data analysis is much more fun than mowing the lawn. Even when files get muddled. We still know little about how well older people cope with boring tasks once they have successfully begun them, but what we have found out is quite encouraging. During very dull prolonged “vigilance” tasks, such as responding to some particular items, but not others, appearing one at a time in sequences lasting from 30 minutes to 1 hour, elderly volunteers seem to be at least as accurate as, and sometimes even better than young adults. In old age we seem to become more patient and effective at easy, dull repetitive tasks such as watching long strings of letters to note every appearance of a particular one that always appears, in clear in a particular position on a display screen. The catch is that if tasks become even slightly harder, such as watching out for pairs of successive numbers that add up to 9, or scanning blurred signals, or watching for signals that can occur at any of several different locations we become inaccurate, tired, bored and restless much sooner than we once did [7,8]. The solution may be to find occupations that are almost as boring as watching gravy congeal but are nevertheless, plausibly, useful. Here new technology is an awesome breakthrough. Tidying up digital photograph collections, purging e-mail boxes, organising and backing up files, reading through day-old Twitter post, sorting and secreting and losing all of my passwords – the info-world pullulates with new opportunities. Towards the end of his extremely long and productive old age Bertrand Russell said that he could no longer do difficult demanding work for more than two hours at a stretch, and only once a day. In old age a solution to endless postponement of increasingly difficult, and so increasingly dreaded and avoided tasks seems to be a firm promise to oneself to start, to try for no longer than an hour and then, ruthlessly, to stop. Unfortunately, after a long lifetime of making unfulfilled promises to myself I am no longer a sucker for this ploy. Old age has made me cynical, even of benevolent self-deception.
. 2. Harriott, J., & Ferrari, J. R. (1996). Prevalence of procrastination among samples of adults. Psychological Reports, 78(2), 611-616. 3. Rabin, L. A., Fogel, J., & Nutter-Upham, K. E. (2011). Academic procrastination in college students: The role of self-reported executive function. Journal of clinical and experimental neuropsychology, 33(3), 344-357. 4. Deniz, M., Tras, Z., & Aydogan, D. (2009). An Investigation of Academic Procrastination, Locus of Control, and Emotional Intelligence. Educational Sciences: Theory and Practice, 9(2), 623-632. 5. Watson, D. C. (2001). Procrastination and the five-factor model: A facet level analysis. Personality and Individual Differences, 30(1), 149-158. 6. Ferrari, J. R., & Díaz-Morales, J. F. (2007). 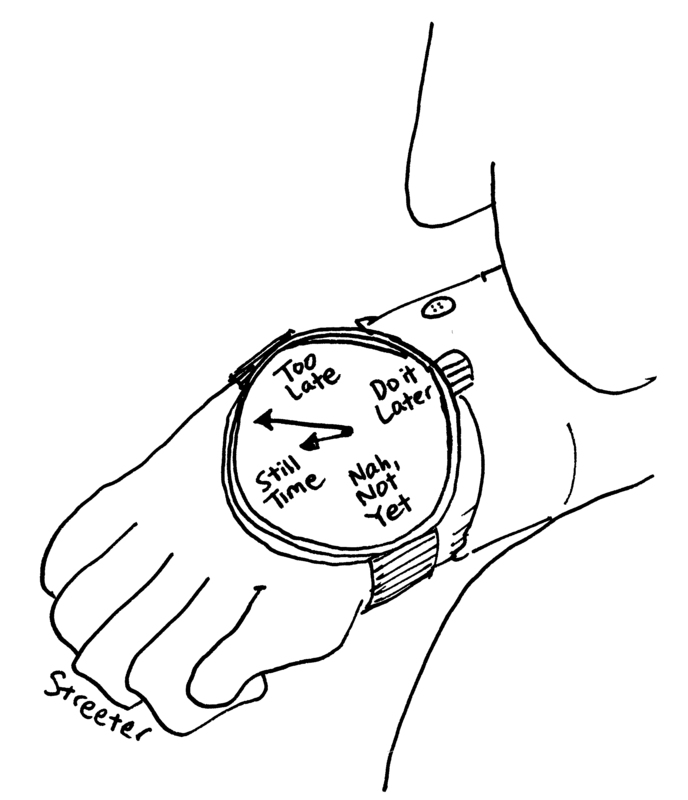 Procrastination: Different time orientations reflect different motives. Journal of Research in Personality, 41(3), 707-714. 7. Mouloua, M., & Parasuraman, R. (1995). Aging and cognitive vigilance: Effects of spatial uncertainty and event rate. Experimental aging research, 21(1), 17-32. 8. Parasuraman, R., Nestor, P. G., & Greenwood, P. (1989). Sustained-attention capacity in young and older adults. Psychology and aging, 4(3), 339.